Usually when I want to paint something, I wield a can of white, lime green or orange spray paint and give new life to a picture frame or chair or patio table. But this is my cat, Isabella. And I painted this portrait of her on canvas. I. Painted. This. I wouldn’t have believed it was possible, but I was there. Last night I attended my friend Rick Pena’s birthday party at Painting with a Twist in Miami Beach, which is owned by another friend of mine, David Sexton. David and I go way back. I first met him back in 2002 when I interviewed him for a musical he wrote and starred in, It’s a Fabulous Life, his modern gay redux of the Jimmy Stewart classic. David writes, sings and acts, but for years now he’s been concentrating on his art. He’s worked for Marvel and has created several decks of gorgeous tarot cards. David owns Painting with a Twist, a studio where adults unleash their inner five-year-old and paint. Rick’s party last night was actually two painting classes, along with a lot of Cuban food and a lot of wine. One class was Paint a Paisley Pet, in which the attendees chose an animal, had it stenciled onto canvas and then let loose with their imaginations. 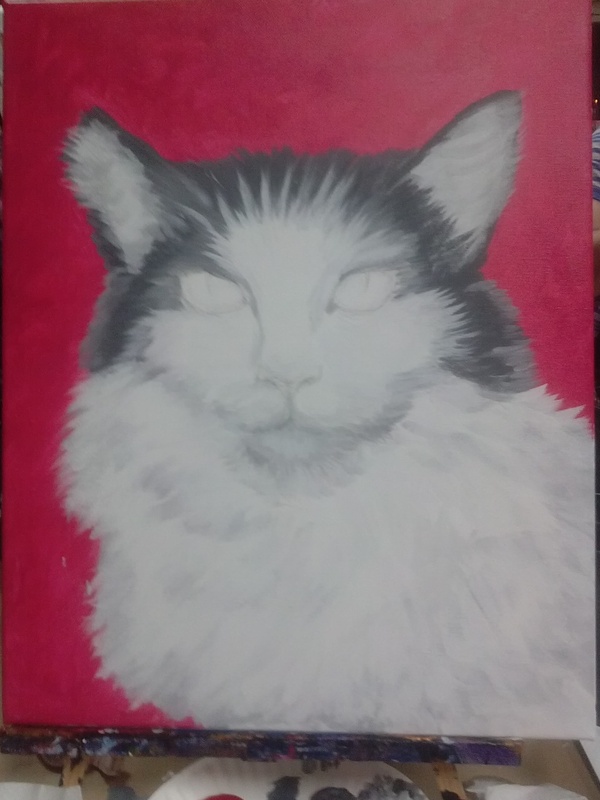 The other class, the one I took, was Paint Your Pet. This one was more involved. I emailed David a photo of Isabella in advance and he sketched her on canvas. When I got there, her sketched portrait was waiting for me on an easel. Honestly, it looked so good—it was a David Sexton original—that I really thought about leaving just like that so I wouldn’t mess it up. We chose a background color for our portrait, and the paint was prepared and waiting for us when we assembled at our spots. David put us at ease, encouraging us to unleash that inner five-year-old and paint. He also encouraged us to take photos to document our paintings. He had us fill in the background color first. It was scary when my brush touched the first stroke of pink to the canvas, but once I did it was ultimately freeing, the same feeling I get when I spray paint a piece of furniture, because I love transforming something into something better. 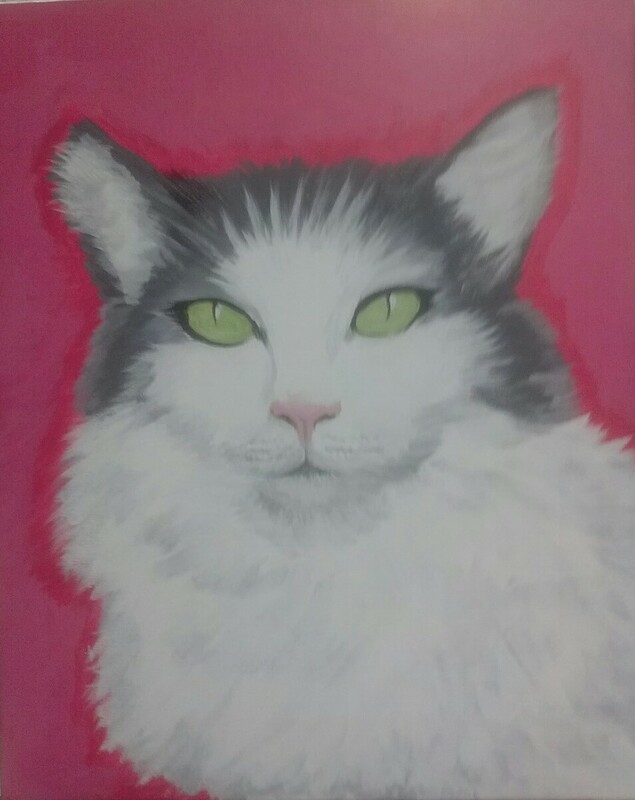 By the time the pink background was finished, Isabella really came into focus. David gave each of us lots of personal attention. He showed me how to mix the silvery gray, white and black paint on my plate to get the different colors of Isabella’s fur. “Obey the fur,” he said, getting us to not just look at the color photo of our pet but, really observe the coloring and patterns. David showed how to layer the colors to create shadows and texture. Under his guidance and direction, my fears melted away. 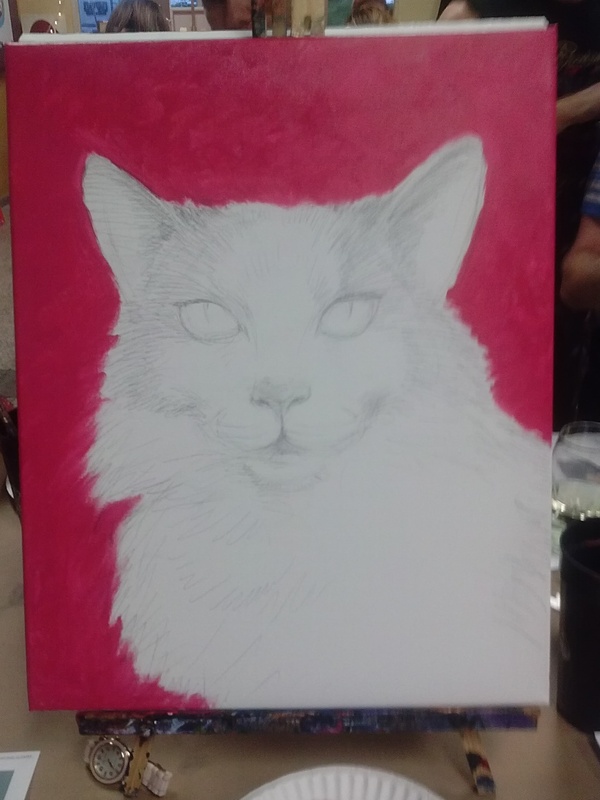 And the more I painted, the more I saw my beloved kitty on my canvas. I’m especially proud that I got her little white tiara right, and that she looks in the painting as soft and fluffy as she is. The hardest part came last. David mixed the perfect shade of green for her eyes and of pale pink for her nose. Thankfully, David painted those parts. Fur is one thing, but I knew I could not capture the beauty of her eyes. And that’s the thing about David and Painting with a Twist—he gives you the confidence to do it yourself, but he’s always there to help. And then, there she was, my Isabella looking back at me from that canvas, in all her regal beauty. I gave David a hug and kiss for not only helping me paint her, but for the great time I had doing it. It was one of the most creative evenings I’ve ever spent. I already have a spot picked out to display my painting. And when I look at that portrait of Isabella, I won’t only see her face, but the faces of friends having fun painting their pets, at Rick’s birthday party. And that kind of memory is priceless. Painting with a Twist is located at 924 71st Street in Miami Beach. 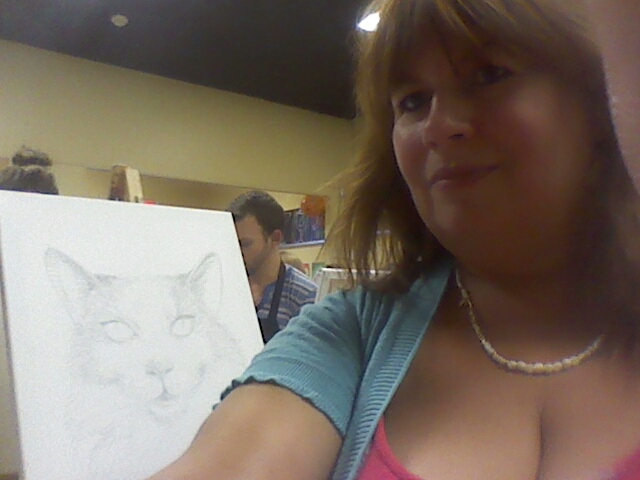 The Paint a Paisley Pet class was $35, and the Paint Your Pet class was $55. For more information, call 786-606-4100, email studio188@paintingwithatwist.com.